During Field Day 2013, the ARTS Club will be transmitting live images from the Field Day site in Cherokee Park. ARTS Club will have a beacon transmitting on the W4CN repeater every 15 minutes during Field Day. 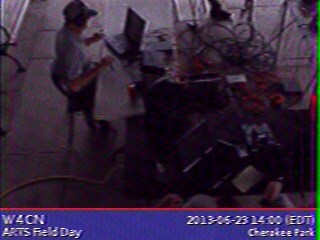 This beacon includes a live SSTV image from the Field Day site. The latest transmitted image is shown above. For previous transmissions click here. To learn how to decode the live SSTV image transmissions yourself, instructions are here on this page. These images will be transmitted over VHF Radio using the W4CN repeater at 147.180Mhz. This is a demonstration of how to get images quickly out of an area without using any wires or connectivity, only radio communications between the locations. These images can be transmitted locally, or over great distances using HF communications. They can be transmitted in a number of different encoding methods that have different image size, quality, and speeds of transmission. For Field Day 2013, we will be transmitting images using the robot36 encoding. This encoding method has been used for numerous space programs as well as being very popular for use by amateur radio. SSTV Images using robot36 encoding were used to send images from the Russian MIR space station, from many satellites over the years, and are also still being used to send images from the International Space Station today. Here is a link that shows some recent images sent via radio from the ISS: http://www.issfanclub.com/image/tid/54. The robot36 encoding method is named because it was invented by the Robot Corporation in San Diego, CA and it takes approx 36 seconds to send an image. This transmission mode is highly optimized for speed over image size and quality. Since we will be tying up the club repeater during transmission, this mode was selected in order to keep the interruptions to a minimum. In order to receive the images, you will need the following equipment. A computer with a software program capable of decoding SSTV transmissions. Suggested software includes some programs dedicated to just SSTV decoding such as RX-SSTV and MMSSTV, as well as many popular general use digital mode programs normally used for PSK31 such as MIXW, or HRD DM780 also have built in ability to decode SSTV transmissions. This document will demonstrate using the RX-SSTV program since is is one of the easiest to use. You will also need a connection between the radio and the computer sound card. You can often simply just use the headphone or speaker jack of the radio connected to a line-in or microphone-in jack on the computer. Here is the link to download the RX-SSTV program: http://users.belgacom.net/hamradio/rxsstv.htm. First of all download and install the software. Next configure your soundcard. The RX-SSTV software as well as MMSSTV assume that you will be using whatever audio interface is set to be the "default" recording device in Windows. This will need to be configured correctly before you run the software. The process is different depending on which version of Windows your running. Below are screenshots to guide you on how to do this for Windows 7. Windows XP can be done through clicking on the audio mixer icon in the toolbar, selecting "recording devices" from the pull down window, and clicking the checkbox under the device you want to use for the default audio input. You will need to ensure that the correct device is set to be the "Default Device". In Windows 7, you can visually see the device when there is an audio signal present by seeing the level meter activity next to the device(vertical strip of bars). If the recording input device you want to use to connect to the radio does not say "Default Device" under it, you must right-right click on the device and make it the default device as shown here. You will also need to adjust the volume levels on the audio input device. This will be important to ensure that the input is not overloaded and distorted which will cause errors in the decoding of the images. Right click on the device, and click "Properties". You will then be able to click on the "Levels" tap at the top and adjust the input level. You will most likely have to return to this a few times once you have the software running, so remember how to get here. Also NOTE: often the correct sound levels are a combination of adjusting the output of the radio via the volume knob if your using a speaker/headphone out, and the levels on the device inside Windows. Once the correct audio input has been setup, you can start the RX-SSTV software. The above image is what the software looks like. It is mostly automated when you start it up. SETUP. If the RX button is not automatically pressed to be green RX, press it. It should automatically detect the beginning and end of image transmissions and be mostly hands off. Also make sure all the DSP buttons are pressed, AFC, LMS, and BPF to active all of the image processing of the decoded images and give a higher quality result. If the image looks slanted, make sure the auto-slant correction is turned on via the menus Setup->SSTV Engine->RX Tab at Top->Checked "Auto Slant" on the far right side of the box. As an image is received and decoded it will fill the image box up from the top down. The most important thing to pay attention to during receive is the audio levels. For best results adjust the audio levels so they are about the middle of the line as show above. (See the GREEN BAR in the signal are on the right). That is it. Setup the audio stuff, and run the software and you should be good to go.